A new phase of political crisis in BiH that started during the pre-election period, has continued after the elections. The Grand Mufti (reis-ul-ulema) of the Islamic community in Bosnia and Herzegovina, Husein Kavazovic told Patria that religious communities should not interfere with 'daily politics', however, it is unrealistic to expect that they will ignore the situation in the society as long as they are interested in everyday lives of BH citizens. Kavazovic underlines that the Islamic community wants a progressive Bosnia and Herzegovina dominated by blue, European color. There is no doubt about that. We have witnessed citizens' protests relating to unsolved murders of two young men, Dzenan Memic in Sarajevo and David Dragicevic in Banja Luka. The desperate parents are accusing the government of covering up the crimes. Can we build the society if people can't exercise their right to life, or at least the right to truth and justice? - The murder is the biggest sin. In BiH, 200,000 of innocent men, women and children were killed. Children were being killed in towns and villages. Today we grieve and cry for those who were killed, we still search for them, while their murderers either hide or walk about freely, before our very eyes. That's why our society is full of sinners and that's how murderers get to make decisions about our lives. One of the God's names is The Utterly Just (Al-Adl). Allah, The Sublime assures that the end for criminals will be more horrifying than the crimes they have committed. The justice will arrive for certain and the one we await. Loss of an innocent child brings pain that only grieving parents can understand, and they will not find their peace until the murderers are punished. The feeling of injustice only increases their pain. I pray to God that their sacrifice and the tears shed repent the sins at least to some extent and awake faith in people that has been lost. It's a long road to the light, for us. Only few have lit up candles or light. Three months have passed since the General elections in BiH. It's still impossible to form a government at the federal level. Political field in BiH is divided between national parties on one side and civil parties on the other side. The former are afraid that the civil BiH could threaten collective rights of peoples. The latter accuse national parties of diluting BH society which has been known for its multiethnicity for centuries. How do you see the future of Bosnia and Herzegovina? - It is not up to the faith communities to interfere with the daily politics and we are doing all we can to save the Islamic community from politicization. Having said that, we can't and we mustn't behave as we are not concerned with what is going on in the country. We are very interested in daily life of the citizens also because some of themare the members of the Islamic community. We are interested in preserving and improving the state, as that is the only framework in which citizens' and other rights can be exercised. Oftentimes in the public discourse we can hear certain politicians saying that, unless their particular political wishes are fulfilled, 'there will be no Bosnia and Herzegovina'. We find such statements ill-intentioned and aimed at relativizing and disputing the statehood of Bosnia and Herzegovina. Bosnia and Herzegovina as a state, as well as the citizens' awareness of its statehood, has outlived much bigger and more dangerous attempts to deny it. BiH will survive because majority of its citizens consider it their only homeland. I'm more concerned about how it will turn out, how it will be governed and how attractive it will be to future generations. We need a modern, liberal and civil state. We need a state governed in the European way with BH 'pattern'. Predominant color will be blue, European. We in the Islamic community have no doubt about that. There is a plethora of examples of multiethnic countries, from Europe to the United States of America. The statehood – the nation is the first priority, only after that come religious, ethnic and other determinants... Can one be equally good believer and a devoted Bosnian and Herzegovinian? Does one exclude the other? - The love of one's homeland is part of iman (Islamic belief). Not only that one can be a Muslim and a good citizen of his/her country, and a patriot – it is the obligation. Every believer is obligated to care for the general good. I have full confidence in faith identity of Bosniaks. Even far more aggressive projects did not separate our people from their faith. Neither 50 years of a systematic atheization nor systematic convincing that you can live in peace with others only if you disown your own identity have achieved that. And these new challenges to our Islamic identity we shall, God willing, get over. Having said that, I think that we still have a great deal to do as regards strengthening our national identity and building a modern nation. The nation is not the state, it is not the culture that incorporates neighborhood, music, song, folk dance, literature, work ethics, faith etc. The believer, however, could not and should not be a nationalist in the negative sense of the word. One of the key problems of BiH lies in the fact that the young citizens are leaving BiH for the EU countries. And while we know who is responsible for it, how can we force the government to pursue urgent economic and social reforms so as to stop this tragic exodus? What can the Islamic community BiH do about it? - We are looking at BH youth leaving the country with great anxiety, particularly those best educated. The Islamic community has been warning about it for years now. The analyses done by the Council of Muftis have revealed this trend; we have urged the relevant persons to make this issue their priority, instead of creating more divisions and sparking new conflicts. We should look at how others resolved the same problem. We are aware that more should be invested in villages, the corruption should be rooted out, motherhood should be supported... Also, the states that had been facing the identical challenge, Israel and Ireland for instance, they gave up the conventional concept of citizenship, particularly the one founded exclusively on residence. It was sad to see during the census and afterwards that we were not heading in the direction of giving rights to the people who have their roots in this country and who feel it as their homeland; instead we observed immature politics burdened by nationalism driving people away from their citizenship, reducing their number. However, it is up to the government to offer us a solution or at least to show they care. The Islamic community is doing its level best to help, particularly those people who have returned to their places of origin. We are also trying hard to be there for our diaspora, and those who have left the country, to keep them close together and tied to their roots. Dodik and Covic are building their political survival on intimidation of their voters with Bosniaks. It can be read in the media every day. Nevertheless, the German interior minister Thomas de Maziere, during your meeting in 2017 in Berlin, spoke about Bosnian Muslims in a very positive context. Similar messages come from many European countries. Who will the world believe to? - It is not good to build relations here or anywhere else on fear, distrust and hatred. It has never brought good to anyone and it will never bring good. I hope that the local politicians will come to realize that. We are proud of our diaspora and wherever we travel or meet with the ambassadors of numerous other, especially European countries, they happily report on contribution by our people. They appreciate it. A new mufti was recently appointed for the European countries. 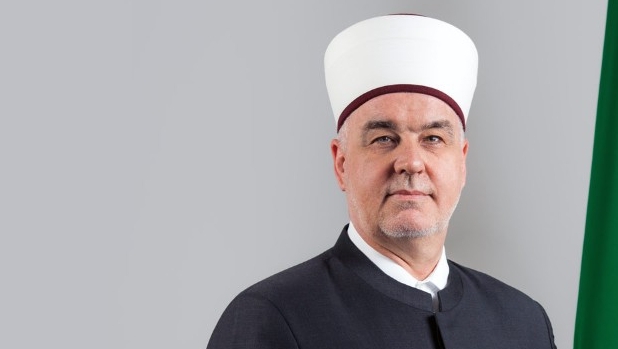 Mufti Osman Kozlic will be the principle imam for Germany and the mufti for the Western Europe countries. He is tasked to show our dedication to consolidate our people there, but also to become better partners to the countries where our members live and work or are their citizens. BH entity RS is almost ethnically clean of Bosniaks and Croats. In Federation BiH, the Croats can fully enjoy the rights of the EU thanks to dual citizenships of BiH and Republic of Croatia. What kind of rights do Bosniaks enjoy in Bosnia and Herzegovina? - I think it would not be good for the future of the Balkans if Bosniaks were to start feeling as if they are being pushed to some sort of reservation at margins of Europe, where they can't make decisions for themselves and their future. It would not be good more so after everything that we were exposed to in the nineties, both we and our country.